Currently tested in heavy lift environments exceeding 10,000 lbs, Invention House’s new 400Hz air-crafted rated drive is ideal for manufacturers seeking a custom variable frequency drive to solve aircraft electric motor control needs. The Invention House 3 Phase Aerospace/Aircraft electrical motor drive is capable of 50/60/400Hz output. This ruggedized drive is designed to withstand temperatures from -40C to +55C and up to 40g shock and 2grms vibration, making it the perfect drive for on-aircraft operations, including helicopter and fixed-wing aircraft. 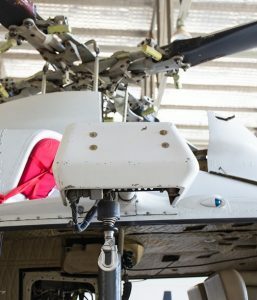 Our new aircraft-rated drive weighs in at 10lbs(4.5kg) and is significantly lighter than commercial drives of the same rating which generally weigh 30lbs or more, thus creating space and weight savings for improved aircraft operations. If you are seeking a 400 Hz drive for an aircraft application, contact Invention House today! 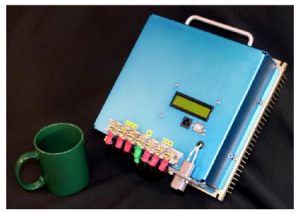 When does developing a custom VFD make sense? Variable frequency drives are now ubiquitous in the motor control industry, with dozens of large to small-scale players offering ready-built products. With just a few quick Google searches you can find drives to meet almost any need. However, like the proverbial square peg in a round hole, sometimes an off-the-shelf drive just doesn’t fit the use case. To help motor control engineers determine when developing a custom VFD makes sense we have created a Custom VFD Checklist that outlines the considerations we work thought when consulting with our clients. While we specialize in building custom AC motor drives, going the custom route is not our first choice if it can satisfactorily avoided. 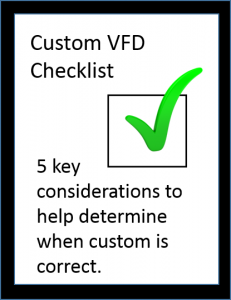 Download our FREE Custom VFD Checklist Now. There are trade-offs for going down the custom path. You get exactly what you need, but it will typically cost more than off-the-shelf, unless substantial volumes are involved. Cost factors may include non-recurring engineering costs (NRE), UL certification costs if required, packaging costs, and/or higher per-unit costs. There is also a timing factor; anything which must be first engineered and developed naturally takes longer than pulling something off the shelf. Other considerations include ownership of intellectual property associated with a new drive, assuming it is truly a one-off design. Case Study – Oil Burner: Recently Invention House created a custom VFD for an OEM that manufactures oil burners used in HVAC applications. Our client needed a 110v single phase drive capable of 80Hz to drive the combustion fan of a portable oil burning heater. The burner is a world-ready unit that must be able to operate between -40 and +130F(55C). In addition, it had to be very rugged to withstand truck transport and rough delivery conditions. 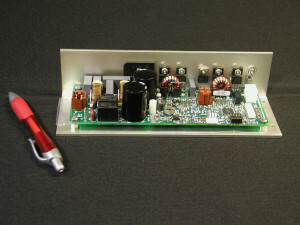 Invention House designed a single board drive in an open 3″x 2″x 7″ aluminum frame. The drive responds to commands for high and low fire rates (100,000/200,000 btu/hr). It has several on-board relays to energized the fuel solenoids and the fresh air blower. The drive has custom adjustable relay timing to avoid flame outs during transitions and to avoid blasts of cold air to the user. The drive’s main function is to create the correct frequency for the combustion fan. This is done using an on-board altitude sensor that allows the drive to maintain the correct air /fuel ratio. There is also a on-bard tilt sensor for safety. These sensors would have been difficult to do using convention PLC’s and a conventional solution would never have fit in the necessary space. The true befit of the combustion solution came at then end of the development when the specification suddenly changed wanting combustion at 14,000 ft. This required 120hz operation and more voltage. Invention House simply reprogrammed the drive for 120hz and designed an small transformer to boost the input voltage to 160vac. The product was successfully tested at the top of Pike’s Peak and has endured operating many thousand of hours in harsh conditions. As the above case study illustrates, if your situation is one where unique factors are involved, such as those outlined in our Custom VFD Checklist, then going down the custom path will be a rewarding one. You end up with a drive tailored to your specific requirements and in the size and shape that fits your design specs. In addition, because the drive is tailored to your product’s specs, there is usually less installation time as the unit comes programmed, tested, and with wiring terminals and other factors that make installation more of a plug and play install. One remaining important factor to share…gaining a competitive edge. If your company is competing with similar products and all those products employ off-the-shelf drives, you can gain a competitive edge by going the custom route. Your product will be unique and have a performance curve that beats the competition and helps create stronger vendor-customer bonds. In summary, don’t be afraid to look at developing a custom variable frequency drive, especially if your product meets one of the 5 key custom VFD decision factors outlined in our free guide. If you have that round hole situation, build a round drive. You’ll be more satisfied in the end and so will your customers. Test meters have trouble reading VFD output voltage because an AC motor prefers sinusoidal power, but a variable frequency drive’s output voltage is NOT sinusoidal. As shown below, a VFD’s output voltage is a series square pulses which range from wider to thinner to emulate a sinewave. The following image represents typical voltage output from a VFD. Controlling variable frequency drive shock hazard is an important part of proper VFD maintenance and management. 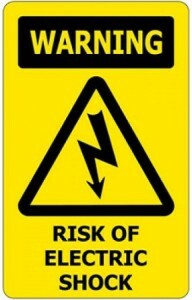 The risk of electrical shock stems from the manner in which motor drives assume control of motor voltage supply. When a drive is energized but disabled, and the motor is stopped, it’s NOT open…there is no air between the line voltage and the motor leads. To safely work on the motor, the line input to the VFD must be opened. Some newer drives have a feature called “safe torque off,” which also is NOT a contractor. When the “safe torque off ” is active and the motor is stopped, the power connection is NOT open…there is no air between the line voltage and the motor leads. Controlling variable frequency drive shock hazard can be accomplished by opening the line input to the VFD. “Safe torque off ” simply interrupts the gate power to the output transistors so that rotation is not possible. The transistor and the diodes still connect the motor leads to the line voltage, which can cause a shock hazard unless the line input to the VFD is opened. The electrical shock potential from a VFD is distinct but potentially related to arc flash. Arc flash, also sometimes referred to as “flash over”, stems from an arc fault, which is a severe instantaneous electrical discharge that results from a low-impedance connection through air to ground or another voltage phase change in a electrical systems. A gaseous fire ball is created filling the space immediately in front of an open cabinet. Arc flash is deadly and all precautions must be made to prevent it. Controlling variable frequency drive electrical shock conditions is a #1 priority at Invention House. We take great precaution when building and working on custom AC motor drive solutions for our OEM and military clients. Consult the users guide, website FAQ page or the help center of your VFD manufacturer before working on any VFD. There are 5 critical variable frequency drive (VFD) limitations that should be considered when selecting the proper VFD for motor speed control applications. A VFD is an electronic circuit that controls the speed of an electric motor by adjusting both the voltage and the frequency applied to the motor. Prior to VFDs, motor speed was controlled through inefficient voltage regulators (think light dimmer switch!) or mechanical means – pulleys, gears, or transmission systems. The original VFDs filled large cabinets and were unreliable. Today, VFDs are smaller than a shoe box, reliable, and are used in almost all industrial applications, pumps, fans, conveyors, machining, compressors, etc. VFDs can also be employed on linear motors to generate vibration, which is often critical in “shaker machines” used in product separation and packaging. However, VFD’s are not miracle workers and there are important limitations. If you are already using VFDs or are considering their use for the first time, these limitations should be considers. 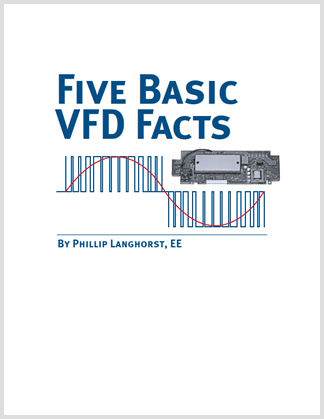 Learn more facts about VFDs in my paper 5 Basic VFD Facts. A VFD can make a motor run slower than rated speed, however a major point of consideration at low speed is cooling. A typical electric motor is cooled by a fan on its shaft; at low speed the fan moves less air and at some point the motor will over heat. This is generally not a problem with centrifugal loads such as fans, pumps, and blowers because the torque required by the load drops drastically with decreasing speed. In this case, the motor is doing less work, and there is less waste heat to dispose of. A VFD can drive a motor faster than its nameplate speed, however, above the rated speed, the motor looses torque (twisting force). At higher speeds, less and less torque is possible. The maximum continuous power (speed times torque) is limited by the motor design, therefore a VFD cannot deliver more power than which the motor is thermally capable. A VFD can also make a motor more efficient, but only at reduced load and/or reduced speed. A drive system will not use less power when the motor is running at rated speed and rated load. In fact, it uses slightly more due to the losses within the drive. A VFD can make a motor reverse without the use of contactors, but it can’t make the reversal faster than the combination of the motor’s max torque and the load’s inertia allows. A VFD can make a motor produce more than its rated torque but only briefly. The amount of time is limited by either the drive’s overload capacity or the motor’s thermal capacity. A drive cannot make a motor produce more than its maximum torque. Max torque or Stall Torque is generally not shown on the motor’s nameplate. The iron in the motor can only sustain a certain amount of magnetic flux density, even if iron is driven harder, the flux density will not go up. The amount of torque a motor creates at the flux limit is the most torque that can be achieved.